Just yesterday I was gushing on about Merriweather Post Pavilion, the latest triumph from Animal Collective. Not sure why I'm feeling the need to defend my opinions, but opinions about the band (especially since the leak of this album) usually fall into categories of extreme opposites. You're either on or your off. Of course, I've been on for a long while and was well aware (back on the Strawberry Jam '07 tour) that they were soon headed for a breakthrough. This album is it, love it or hate it -- it's truly hard to ignore. I think my unashamed dalliance with Animal Collective is rooted in the malleable psychedelics they mine. In theory they are not unlike Faust, Beefheart, Boredoms, and (wait for it) Psychedelic Horseshit - in that these bands spread myraid tentacles out beyond the normal constructs of song and melody. One is free to follow whichever one they choose, a new adventure with every listen, the ability to pad and fill the holes with imaginary noise or sate the nerves by focusing in on one particular path. 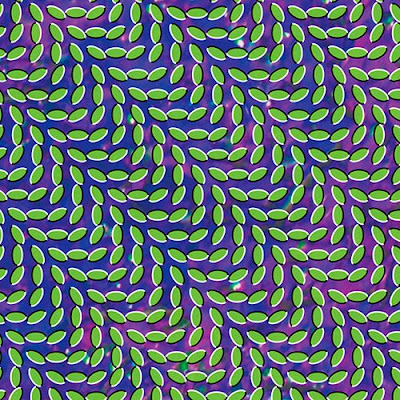 Merriweather Post Pavilion ebbs and flows in a similar fashion, but continuously (with the exception of maybe "Bluish" and "No More Running") crests in day-glo and tribal rhythms. It's not a dance record, it's not electro, it's not mongoloid-funk or hep-folk -- this band has wild aspirations to create fresh, pop wonders, and if that comes clad as the "event of the year" only days old or causes the latest/greatest blog-splosion since the birth of the internet, so be it. I enjoy every minute of it. As a side note...I'm equally in love with Hipster Runoff's theory that Animal Collective is a band "created by/for/on the internet" and how the internet has forced us all to love them. Much of this is true, but who's counting. I enjoy every minute of it. i think the "break out" happened with sung tongs, i've not been a huge fan of anything thats happened since that record (in my opinion their best) but i will for sure be checking this out. i think feels was the first record where i could actually pick out parts that sounded like other bands, making them easier to describe.... this was kind of a bummmer to me.